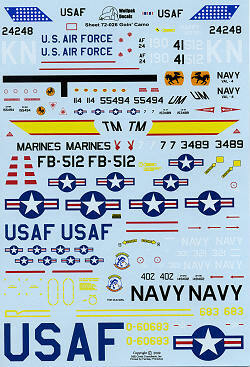 More Vietnam era stuff from Wolfpak Decals. This has a few experimental schemes as well as the norm and some wit a bit more color in them. The instruction sheet for this set is the best in the business when it comes to background information and what may be needed to accurately depict the aircraft being modeled. In addition to the actual placement profiles, there are several additional pages of information that include a history of the type, kits and update bits for these schemes, as well as load-out information, and any changes needed to properly model the aircraft in question, assuring you of the most accurate model you can have. For our first subject, we have an F-105D from the 334 TFS/4 TFW in 1965. This was one of the earlier SEA schemes before tail codes so it still has the older blue fin stripe on it. Next is an OV-10A from VAL-4 in overall light gull grey. In a more appropriate scheme for night ops, we have two HAL-3 UH-1B Hueys from the 1968 time period. One in olive drab and the other in matte black. 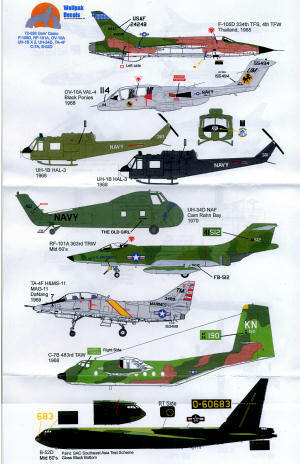 The UH-34D was a station hack/SAR bird from Cam Rahn Bay in 1970 and in overall olive green. The RF-101A was with the 363 TRW and in an experimental SEA scheme of three greens on the upper surface and ADC grey undersides. All this camo was somewhat compromised by the large insignia that the plane used. The TA-4F was widely used by Marine Corps units for fast FAC services and that includes this one from H&MS-11 at DaNang in 1969. Though they did get very grungy, they retained the standard USN scheme. Not often featured in a decal sheet is this C-7B from the 483rd TAW. It is one of many aircraft received from the Army when the Army had to give up its fixed wing transports. Finally, a B-52D from an unknown unit in the mid 1960s. This one has a somewhat unusual upper surface camo scheme that is closer to the SIOP scheme of later years.